children: Osgood, Elvis. Career: 1946—professional stage debut in Brattleboro theater, Vermont; other summer stock and television work; 1953—film debut in The Actress ; 1954—Broadway debut in Tea and Sympathy ; later stage roles include Look Homeward , Angel , 1957, the musical Green-Willow , 1960, Equus , 1977, and Romantic Comedy , 1979; 1983—in TV mini-series For the Term of His Natural Life ; 1987—in TV mini-series Napoleon and Josephine: A Love Story . Awards: Best Actor, Cannes Festival, for Goodbye Again , 1961. Died: 12 September 1992. "Anthony Perkins," interview in Cinema (Beverly Hills), March-April 1965. "Pinning Down the Quicksilver," interview with Robin Bean, in Films and Filming (London), July 1965. "What's Tony Perkins Really Really Like?," interview with B. Berenson, in Inter/View (New York), November 1972. "Berry and Tony: A Love Story," in Interview (New York), Janu-ary 1974. Interview in L'Ecran Fantastique , July-August 1983. Interview with François Guerif, in Revue du Cinéma (Paris), May 1989. "Live Bates," interview with Mim Udovitch, in Interview (New York), November 1990. Palmer, Laura Kay, Osgood and Anthony Perkins , Jefferson, North Carolina, 1991. Winekoff, Charles, Split Image , New York, 1996. Current Biography 1960 , New York, 1960. Gow, Gordon, "Closer to Life," in Films and Filming (London), April 1975. Tanner, L., "Anthony Perkins," in Films in Review (New York), August/September 1986. Obituary in Variety (New York), 21 September 1992. Weinraub, B., "Anthony Perkins's Wife Tells of 2 Years of Secrecy," in New York Times , 16 September 1992. Bowles, J., "Friends, Co-stars, Remember Psycho Star Anthony Perkins," in Classic Images (Muscatine), October 1992. Thomson, David, obituary in Film Comment (New York), November/December 1992. Rose, Frank, "The Prodigal Son," in Premiere (New York), Octo-ber 1993. 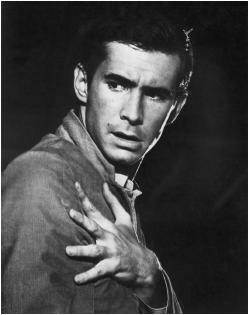 Schoell, William, "Anthony Perkins: The Mirror Image of Norman Bates?" in Filmfax (Evanston), September-October 1995. Thomas, D., "On Being Norman: Performance and Inner Life in Hitchcock's Psycho ," in CineAction (Toronto), no. 44, 1997. Looking back from Crimes of Passion through Psycho to Anthony Perkins's early career, it comes as something of a shock to realize that Hollywood initially fashioned his persona to signify healthy boy-next-door normality. His first two roles immediately established the opposing comic and serious sides of his image. He portrayed, on the one hand, an enthusiastic but callow and unimaginative suitor in The Actress , and, on the other hand, an earnest and sensitive Quaker boy reluctantly learning what it means to kill in Friendly Persuasion . Perkins was instantly perceived as immensely attractive, and the nature of the attractiveness posed a problem for a cinema dedicated overall to the preservation and reinforcement of clear-cut gender identity. Perkins's charm was centered on an abundance of qualities traditionally associated with femininity—sensitivity, vulnerability, diffidence, and a physical and emotional delicacy and frailty—a combination that might tend to arouse sexual feelings not only in women, but disturbingly and dangerously, in men. Given a potential new star then, Hollywood was somewhat at a loss as to what he might star in . During the next few years several solutions were attempted: eccentric roles in eccentric comedy ( The Matchmaker , Tall Story ); a boy learning to become a man under the guidance of an older role model ( The Tin Star ); and roles in which vulnerability could be justified by an unbearable situation ( On the Beach ). But the pre- Psycho film that most closely suggests the solution that was finally adopted was Fear Strikes Out . Perkins's feminine characteristics could be at once contained and explained if they were associated with neurotic disorder. The Norman Bates of Psycho , clearly Perkins's greatest performance, is also the definitive one in which the solution is perfected, and Perkins was never able to live it down. Norman gives all those attractive Perkins qualities their most complete embodiment and expression and is then revealed as hopelessly insane. There have been many attempts to define the fascination of Hitchcock's extraordinary film, but most of them miss its core, the very basis of its power to disturb: the extremely complex play with gender and the transgression of traditional gender boundaries. After Psycho , Perkins's career became problematic, although he never gave a phoned-in performance and he reaffirmed his acting credentials by replacing Anthony Hopkins in Broadway's Equus . After his misguided flight to Europe to find opportunities for "serious" acting he felt Hollywood had denied him, there were halfhearted attempts to reestablish him as a romantic lead. Instead Perkins eventually came to terms with the stigma of being everybody's favorite mama's boy although it is a bit disheartening to witness the deterioration of his youthful persona into a breeding ground for psychoses from Psycho onward. Within the limits imposed by type-casting, Perkins triumphed especially in Pretty Poison , as a garden variety mental case outclassed by a diabolically twisted high school honor student acted by Tuesday Weld in a parody of her Thalia Meninger role from television's Dobie Gillis . As the mask of fresh-faced good looks faded, Perkins seemed positively ferretlike, his eyes burning with secrets he had been hiding from movie audiences. If he is disproportionately jittery in the all-star company of Murder on the Orient Express , and so transparently dysfunctional in Mahogany and Play It as It Lays as to seem certifiable, he is haunting as the target of revenge in Remember My Name and eerily vindictive as unyielding Inspector Javert in a splendid television adaptation of Les Misérables . After meshing with the blackly comic ironies of Winter Kills and lampooning his image as all-purpose nutcase in Ken Russell's florid Crimes of Passion , Perkins made peace with the person responsible for his stifled stardom: Norman Bates. Resurrecting that character's tragic flaws for campy effect in Psycho II , Perkins gives a moving performance as if finally reconciled with the cinema's most popular transvestite slasher. Directing himself in Psycho III brought the reward of teaming with another idiosyncratic presence, Diana Scarwid, but Psycho IV explained the unexplainable in overly explicit Freudian terms. The horror flicks that followed were cheapie exercises that incorporated Perkins shouting boo! as if his mere presence were so scary, decent scripts were unnecessary. An extremely gifted actor who inadvertently created his own Frankenstein monster, Perkins could point with pride to his singularly brilliant creation, even if an argument could be advanced that the saddest casualty of Norman Bates's murder spree was Perkins's career.